In the throne room of heaven on the right hand of the One on the throne, there is a scroll of unprecedented importance. It is written on the inside of the scroll and on the back, something not often done as it was more difficult to write on the reverse side of the scroll, which was against the grain of the papyrus. It is sealed seven times to insure its secrecy; for it contains the full account of the destiny of the world and human history. It is a book on the course of history (see Psalm 139:16). An angel appearing as a town crier calls for one who is worthy to break the seals and open the scroll. The summons has been put forth through all of creation and no one is found who is worthy to reveal the meaning of history. No one is able to read and ponder the scroll's words. It appears as if the promise of Revelation 4:1, "Come up here, and I will show you what must take place after this," will remain unfulfilled. Understandably, John breaks down in bitter weeping. Without the unrolling of the scroll, God's plan for creation will be circumvented. The destiny of the world will no longer be assured. Any attempt to envisage a literal seven-horned, seven-eyed lamb will discover that the meaning of the vision is missed. John's vision is symbolic in character. This scene in the throne room of heaven is not descriptive, but symbolic of the decrees and action of God in human history, in particular as it centers on the cross and resurrection of Jesus Christ. Now that the Lamb has creation and its destiny in his hand, John witnesses a scene of universal worship. 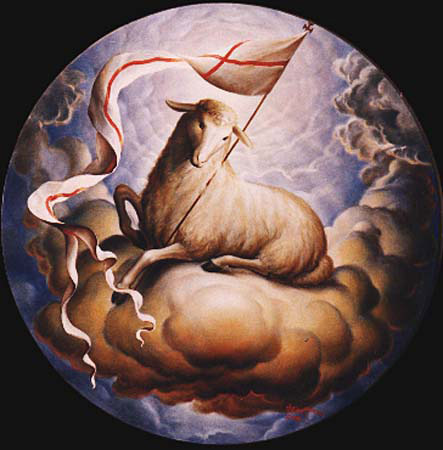 Three reasons make the Lamb worthy to open the scroll: 1) he was slaughtered, 2) his death purchased women and men for God, and 3) he made those whom he purchased a kingdom and priests. 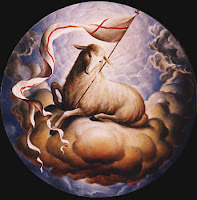 It must not be missed that the same kind of adoration given to the Lamb in chapter five is quite similar to the worship given to the One on the throne in chapter four.